The rampant crony capitalism of the federal government simply can't be ignored anymore, but the media has made a habit out of selectively picking and choosing what it wants to report on with this administration. This latest example may ultimately be ignored and denied too however, because it involves the brother of our current vice president. According to Charlie Gasparino of Fox Business, a subsidiary of the construction company called Hill International was handpicked last year to oversee the building of at least 100,000 affordable homes in decimated areas of Iraq. When asked why his company was chosen over all the others, company president David Richter didn't beat around the bush. "It really helps to have the brother of the vice president as a partner," he said. Liberal shill Arianna Huffington predictably echoed left-wing talking points on ABC's "This Week" Sunday concerning Fox News's coverage of the British hacking scandal being "embarrassing for journalism." This could confirm what many suspected all along - the corporate heads at General Electric (NYSE:GE) would try to use their media holdings to portray President Barack Obama and his administration in a positive light in order to gain a corporate advantage. 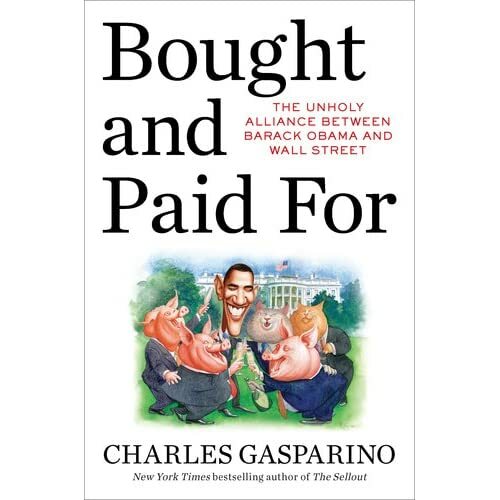 That's how former CNBC reporter and current Fox Business Network senior correspondent Charlie Gasparino explains it in his forthcoming book, "Bought and Paid For: The Unholy Alliance Between Barack Obama and Wall Street." On last night's 'O'Reilly Factor,' Fox Business Network reporter Charlie Gasparino claimed that during his time at CNBC, General Electric Chairman and CEO Jeff Immelt suggested to senior CNBC staff that they were being too hard on President Obama. Gasparino did not say that it became official CNBC policy to tone down criticism of the president. But he claimed that "the question of whether they were being fair to the president was brought up" and that he had "never heard that before." Keep in mind that at the time GE stood to make a whole lot of money from some of Obama's key policies. NBC and its affiliates have conspicuously shilled for such policies before. Even absent an official NBC or CNBC policy on criticizing the president, the incident demonstrates a profound lack of journalistic neutrality. There has always been a looming conflict of interest at GE's television arm. The possibility that higher-ups suggested reporters go easy on the president raises all sorts of questions about the abilities of NBC, CNBC, and MSNBC to fairly and accurately report the news (video and transcript of Gasparino's statement below the fold). Conventional wisdom on the right and left has been that President Obama and the Democrats will pay a heavy price in the November mid-term elections for passing the deeply unpopular health care reform bill. But Fox Business Network's Charlie Gasparino isn't so sure. Gasparino appeared on the network's "Imus in the Morning" on March 25. "They can all get even in November then," Imus said of conservatives and Republicans. But Gasparino pointed out the indispensable weapon liberals have their side: the "cheerleading" news media. "You know, listen - there's not a lot of good reporting on this stuff, and that's the scary thing," Gasparino said. "Someone should Google or do a LexisNexis on how many times the media positively portrays the savings of this - $138 billion over ten years. To me? This sounds like Enron to me - you really have to believe in a lot of assumptions, and the chicanery of the White House." Is President Barack Obama's administration showing hints it is losing confidence in Treasury Secretary Timothy Geithner? CNBC's Larry Kudlow said the signs are suggesting as much. The host of "The Kudlow Report" said in an appearance with CNBC On-Air Editor Charlie Gasparino on his March 17 broadcast that a statement put out earlier today by the administration, and placed at the top of the Drudge Report, hinted this was the beginning of the end for Geithner. "You know, statements out of the blue - statements like this are what I call a real bad leading indicator that Geithner's time, days may be numbered," Kudlow said. "It may not happen in the next week, but it may happen." The statement was made in relation to the Treasury Department's handling of the brouhaha surrounding the $165 million in bonuses paid out to American International Group (AIG) executives, even though they were recipients of bailout money from the Troubled Asset Relief Program (TARP). In light of their reporting on the failure of investment firm Bear Stearns Companies Inc. (NYSE: BSC), it seems CNBC reporters aren't "tip-toeing around on eggshells" when reporting about problems at Lehman Brothers Holdings Inc. (NYSE: LEH). On CNBC's "Squawk Box," reporter Charlie Gasparino told co-host Joe Kernen, "I will say this about the Bear Stearns thing when you compare that [Lehman] with this. I think our reporting was incredibly responsible. It was so responsible ... and you know we went out of our way with Bear Stearns ... We just report on how feckless management is and I can't help that Bear Stearns was feckless. [Lehman] was feckless too and that is the scary part." "They're going to parse every ‘is' that a journalist said," said Kernen. "We don't hammer the stock. We watch the stock get hammered and then we talk about it." Although the collapse of Bear Stearns happened back in March, the debate still rages as to what led to the failure of the 85-year old investment bank that had survived years of previous turmoil, including the Great Depression. After JPMorgan Chase (NYSE:JPM) CEO Jamie Dimon appeared on PBS's "The Charlie Rose Show" July 7 and commented on an August 2008 Vanity Fair article alleging that CNBC reporting could have been part of Bear Stearns' downfall, the cable channel's on-air editor Charlie Gasparino criticized what was claimed in the article and Dimon's reaction on CNBC's July 8 "Power Lunch." "Well, you know, he [Dimon] said one thing that I'm just - listen, I didn't watch it," CNBC's Charlie Gasparino said, "I'm just going by what appears to be a transcript here: ‘Where there's smoke, there's fire.' Oh really? Sometimes where there's smoke, there's no fire, Jamie. I've got news for you."